Welcome to the only edition of Top Ten Things that goes to eleven! 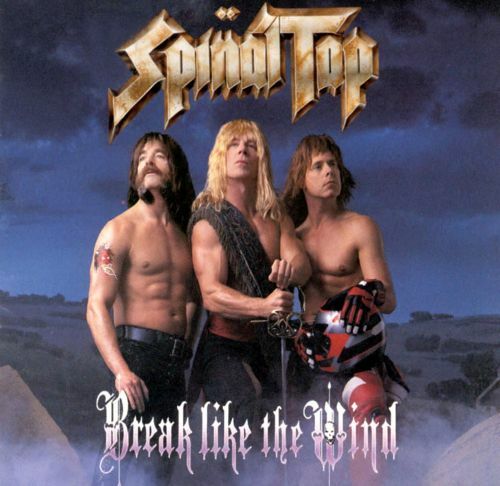 Today we're ranking the songs of everyone's favorite fictional heavy metal band, Spinal Tap! 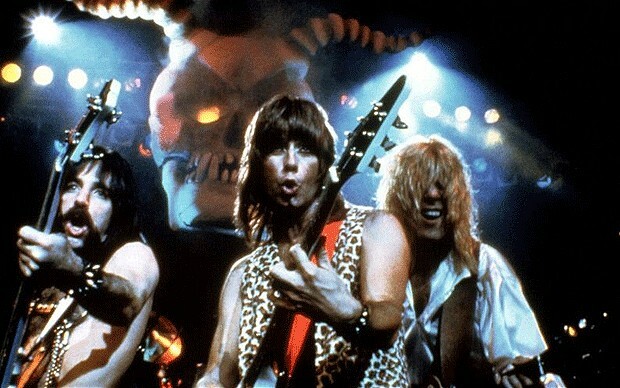 Made famous of course by the 1984 Rob Reiner "mockumentary," Spinal Tap's three core members are David St. Hubbins (Michael McKean), Nigel Tufnel (Christopher Guest), and Derek Smalls (Harry Shearer). The largely improvisational masterpiece This is Spinal Tap lampooned the world of hard rock n' roll, taking no comedic prisoners and delivering some of the all-time great metal-related, "too close to home" comedy bits. Who can forget Nigel's wireless unit picking up the control tower at the Air Force base? Or Derek setting off the airport metal detector with the foil-wrapped cucumber stuffed down his pants? Or undoubtedly the most famous bit, Nigel's custom Marshall head whose dials all go to 11? The film is an absolutely hysterical satire of the rock industry, featuring totally authentic performances from the entire cast and a flawless script. It's simply one of the most quotable films ever made. But what sets This is Spinal Tap apart from other fake documentaries is the legitimacy of the musicians. McKean, Guest, Shearer, and the rest of the band played their own instruments, and along with Rob Reiner, wrote all the songs. And despite the lyrics being mostly tongue-in-cheek (and brilliantly funny), this band put out some pretty great hard rock tunes, including a full album's worth featured in the film, and a follow-up eight years later (which in my opinion is the better of the two records). McKean and company are all great comedic actors but I'll be damned if they aren't accomplished rock n' rollers too. 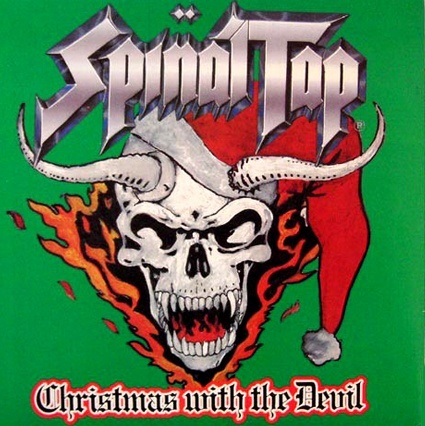 A title that dates back to the production of the film, "Christmas With the Devil" is exactly the type of song its moniker implies; a Satanic Christmas carol complete with jingle bell accompaniment and morbidly descriptive lyrics. "The elves are dressed in leather and the angels are in chains," intones David to kick off this Sabbath-esque dirge. Featured on the second album Break Like the Wind, this might be the most purely "metal" sounding of all their tracks. Notice also the word "Hallelujah" sung backwards in the bridge. Hilarious. Another song from BLTW, "Rainy Day Sun" is meant to be one of the band's late 60s recordings, from when Spinal Tap were a psychadelic hippie band. 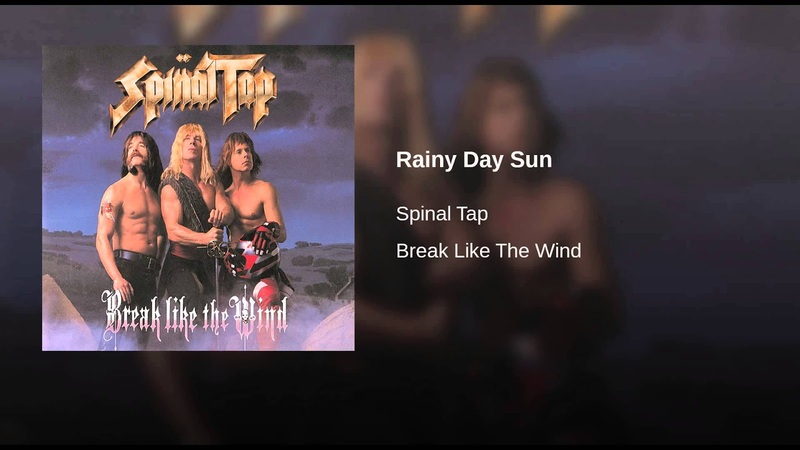 With heavy Beatles influences including some backtracked vocals and rain sounds, this song captures the spirit of the era, lending some tangible depth to the band's fictional backstory. A power ballad duet from BLTW, "Just Begin Again" features a guest appearance by Cher and makes use of deliberately trite love song lyrics like "Life is just a meal/And you never say when," and "Life is just a show/Go reload your gun." And despite the silliness of the words, this song is actually poignant and powerful, led by two strong vocal performances. In the context of the film this tune is from the "pretentious, ponderous collection of religious rock psalms" known as The Gospel According to Spinal Tap. 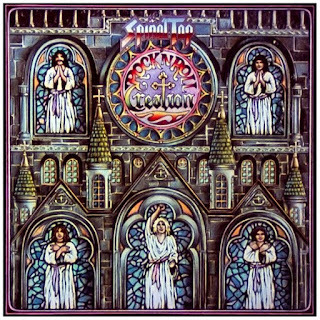 Melding biblical elements with hard rock tropes, "RNR Creation" has one of the more evil-sounding main riffs in the catalog, mixed with simple but memorable vocal harmonies. This song was featured in the unforgettable movie scene where Derek gets trapped in his "body snatcher" pod for the duration of the tune. 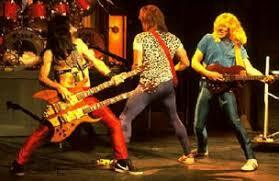 Nigel Tufnel's big number from the film, "Hell Hole" was the only song at that time given a music video. This midtempo rocker deals with fish out of water elements, where Nigel at first laments his surroundings as a starving musician ("The window's dirty/The mattress stinks/This ain't no place to be a man"), and then after finding fame and fortune decries his newfound posh lifestyle ("The sauna's drafty/The pool's too hot/The kitchen stinks of boiling snails"). While it's a funny song, it actually nails the paradox of the wealthy rock star; how can a metal guy still have that nasty edge when he lives in a mansion and eats gourmet food? Lyrically this is one of their best tunes. The second song from Break Like the Wind, "Majesty" features a galloping beat and an appropriately regal tone. It's simply a love letter to rock n' roll, with pedestrian metaphors like "There's a pulse in the newborn sun/A beat in the heat of noon/There's a song as the day grows long/And a tempo in the tides of the moon." It sums up perfectly the popular but hackneyed idea of writing a generic song celebrating rock music. And that syncopated beat is simply infectious. Before Sir Mix-A-Lot famously celebrated big butts and not lying about liking them, there was Spinal Tap's "Big Bottom," a funky half-time groover with all three primary band members playing bass (Get it? Bottom?). This song boasts some of the funniest sexual puns ever recorded ("My baby fits me like a flesh tuxedo/I'd like to sink her with my pink torpedo"), and one of the band's catchiest choruses (with the outrageously funny line "Big bottom/Big bottom/Talk about mudflaps, my girl's got 'em"). 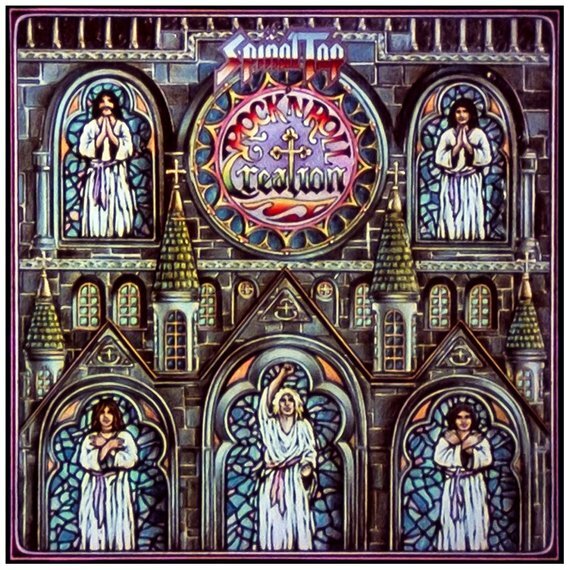 Lampooning all the innuendo-laden 80s hard rock hits, "Big Bottom" outdoes 'em all. This Iron Maiden-esque shuffle kicks off with some killer guitar harmonies and proceeds to butcher numerous idioms with hysterical results. The title is of course a play on the old English saying "The sun never sets on the British Empire," while the lyrics meld nationalistic themes ("Bolder than the pirates/Who used to rule the sea/Braver than the natives/Who never heard of tea") with philosophical nonsense ("Even the biggest elephant never forgets/And the sun never sweats"), with the usual lustful rock tropes ("You knew you'd met your master/When I made you stay at home/Woman/Whatever made you roam?"). This bizarre combination produced one of the band's hookiest and most amusing songs. 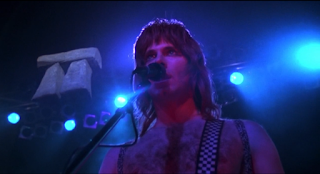 The biggest and most hilarious set piece in This is Spinal Tap is of course the "Stonehenge" number - Nigel's brainchild where the band is supposed to play the song in front of a gigantic tryptich set. Only problem is the drawing submitted to the set designer specifies 18 inches instead of feet, resulting in a tiny piece of scenery being lowered onto the stage. Absolute genius. And the song is pretty great to boot, bringing to mind 70s prog/folk rock a la Jethro Tull. From the pretentious spoken-word intro to the epic verse/chorus structure, this song thoroughly captures the mood of so many 70s prog bands. 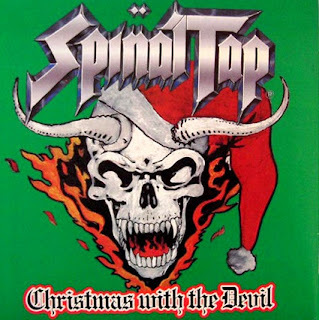 For me the most epic Spinal Tap song is the second album's title track. First off, the entire song is based on a fart joke. Absolutely brilliant. 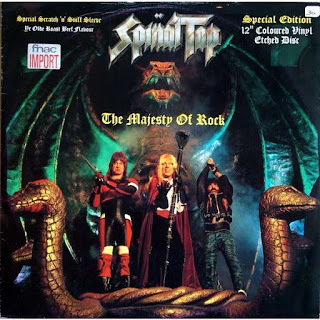 Second, this tune features arguably Michael McKean's best vocal performance, which runs the gamut in terms of dynamics and includes some killer forced vibrato. Third, the final act of the song is a series of traded guitar solos, with guest spots by Slash, Jeff Beck, Steve Lukather, and Joe Satriani. Just an awesome hard rock opus.